A very well presented investment mid-terraced Town centre property divided into two self-contained flats (1 bed & 3 beds) with full HMO licence and good rental income. 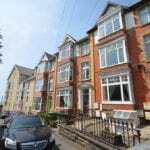 Studio flat let till August 2018, 3 bed flat let for 5 years from May 2018. STUDIO/LIVING AREA 13′ 5″ x 10′ 9″ (4.09m x 3.28m) Double glazed sash type bay window. Storage heater. New laminate wood floor. Service cupboard with shelving above. KITCHEN 11′ 8″ x 6′ 4″ (3.56m x 1.93m) Range of base and eye level units. Wall mounted convector heater. Electric oven with electric hob and extractor hood over. Stainless steel sink unit with water heater over. Tile effect lino flooring. SHOWER ROOM Shower cubicle with Triton electric shower unit. WC: Washhand basin: Storage cupboard. Part tile wall surround. SHOWER ROOM Shower cubicle with Triton electric shower unit. Wash hand basin. WC: Fully tiled walls. Electric towel heater. Radiator. LANDING Staircase to second floor. LOUNGE 17′ 7″ x 10′ 9″ (5.36m x 3.28m) Bay sash window. High ceiling. Radiator. KITCHEN 11′ 8″ x 10′ (3.56m x 3.05m) Range of base and eye level units with laminate worktop. Stainless steel sink unit. Integrated gas hob with electric oven under. Lino flooring. Worcester gas boiler which provides for central heating and domestic hot water. BEDROOM 1 7′ 7″ x 12′ 3″ (2.31m x 3.73m) Radiator. Laminate floor. BEDROOM 2 8′ 7″ x 12′ 4″ (2.62m x 3.76m) Radiator. Laminate floor. BEDROOM 3 10′ 2″ x 11′ 3″ (3.1m x 3.43m) Radiator. Laminate floor. SERVICES Mains electric, water, drainage & gas. Electric heating to ground floor. Gas central heating to upper floors.